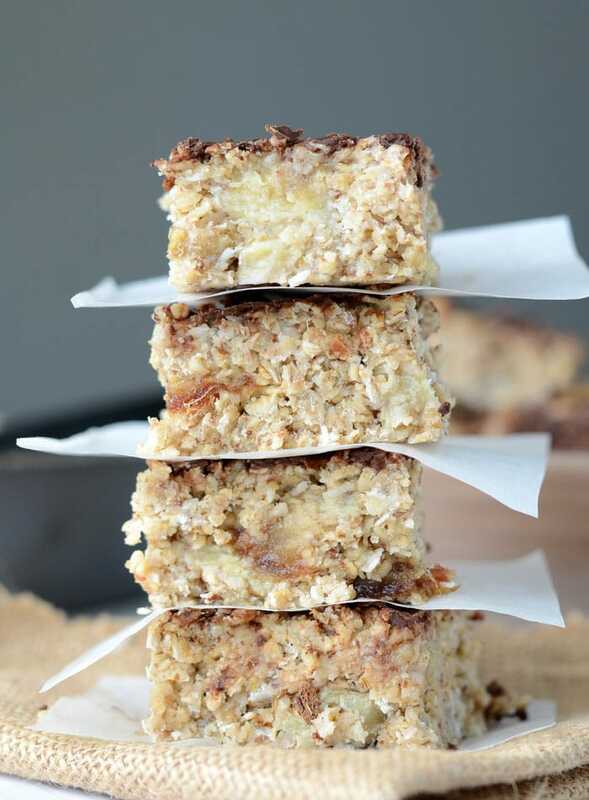 These healthy, vegan baked banana oatmeal bars are just what you want to wake up to in the morning. 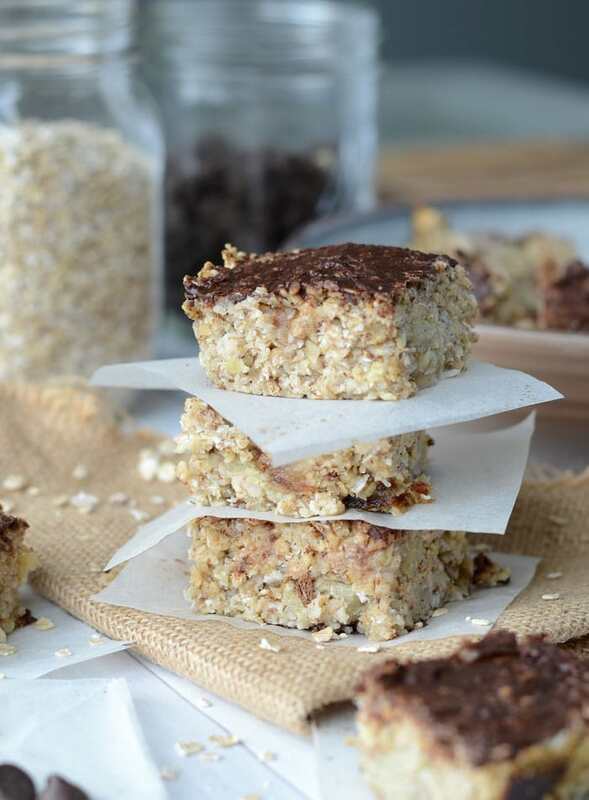 Made with heart-healthy oats, shredded coconut, chopped banana and dates, they’re packed with both flavour and nutrition. If you’re feeling like you need some chocolate in your life, top them with melted dairy-free chocolate chips for a special treat! 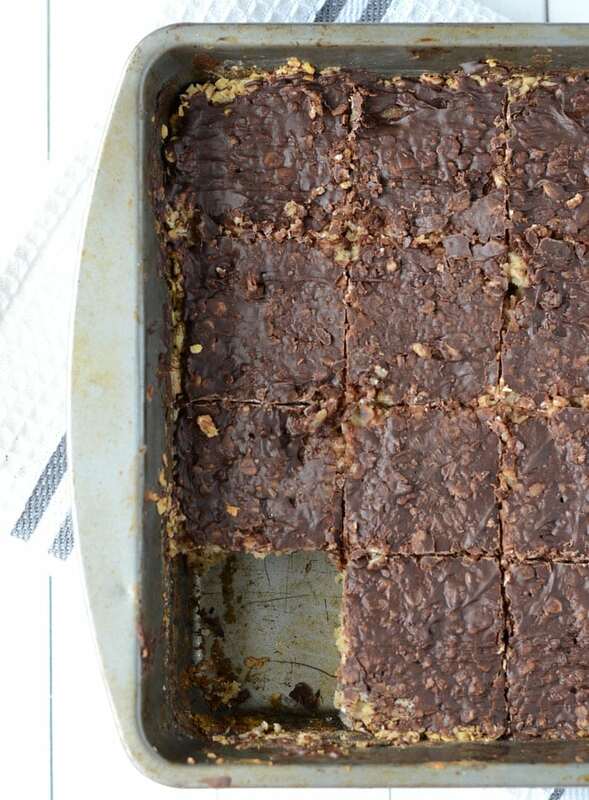 You can cut these bars into 8-16 pieces depending on how large you want each serving to be. 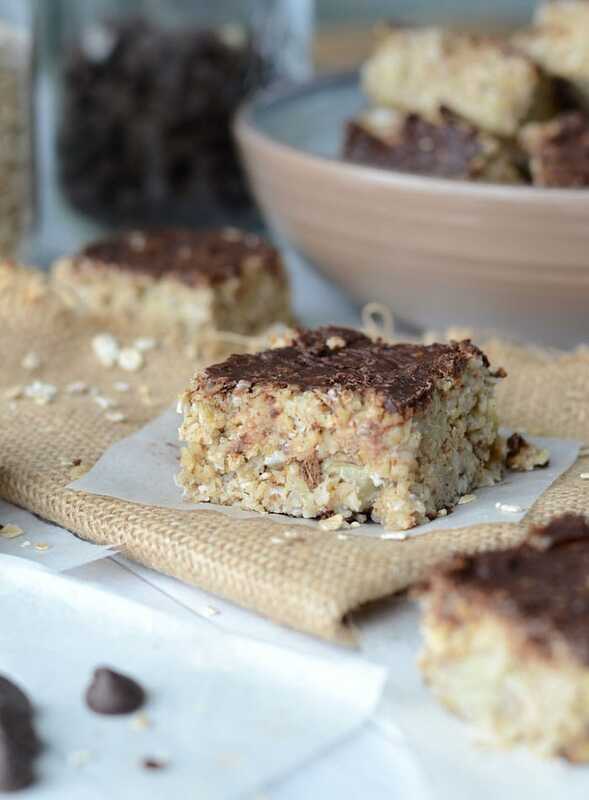 If you make 16 bars out of this recipe, each bar will have 119 calories with 3.4 grams of fat, 20 grams of carbohydrates and 2.7 grams of protein. Not bad, not bad at all! Of course, if you leave out the chocolate the fat will be reduced to next to nothing. I like to make 16 squares but if you plan to eat these for breakfast, you could cut them into 8 larger bars. The texture of these is similar to a muffin so they are quite filling either way! Oh, and they go very nicely with a cup of coffee as a mid-morning treat! If you want to add the optional chocolate topping you can either melt some dark chocolate or dairy-free chocolate chips, or you can make your own chocolate ganache using the recipe below. Melt the coconut oil then gently stir in the the cocoa powder and maple syrup. Spread the mixture over the bars once they come out of the over. This will harden into chocolate ganache after chilled in the fridge. Whether you make your own ganache or go store-bought, I’d definitely recommend going for the chocolate topping. I only used 4 tablespoons of chocolate chips to cover the whole batch, so it doesn’t actually add that much fat and sugar to the recipe. I’ve made these with both homemade chocolate and melted chocolate chips and they’re delicious either way. If you plan to take them on the road with you, I’d use melted dark chocolate or melted dairy-free chocolate chips as they won’t melt as quickly as the coconut oil chocolate ganache once at room temperature. 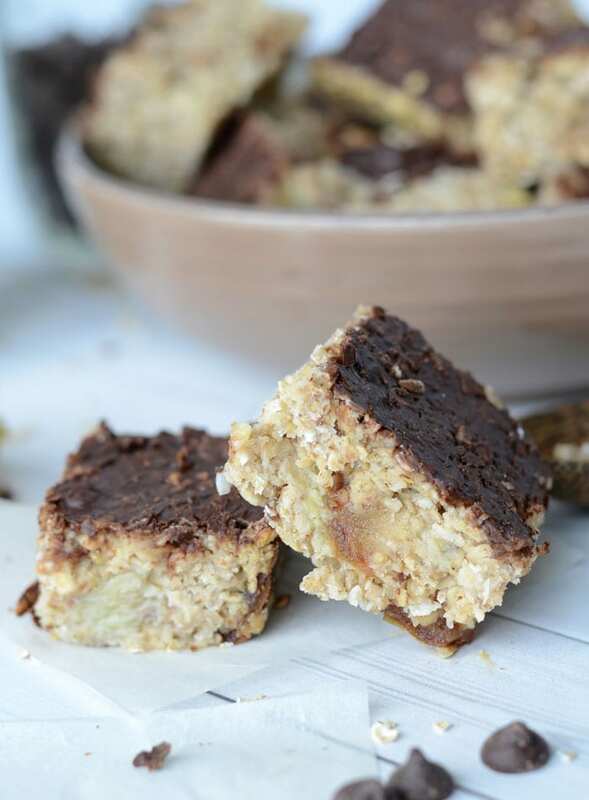 These oil-free bars have no added sugar so they aren’t super sweet however, the bits of dates and bananas add a really nice natural sweetness throughout. They’re gluten-free and vegan and really easy to make with just a few simple ingredients. 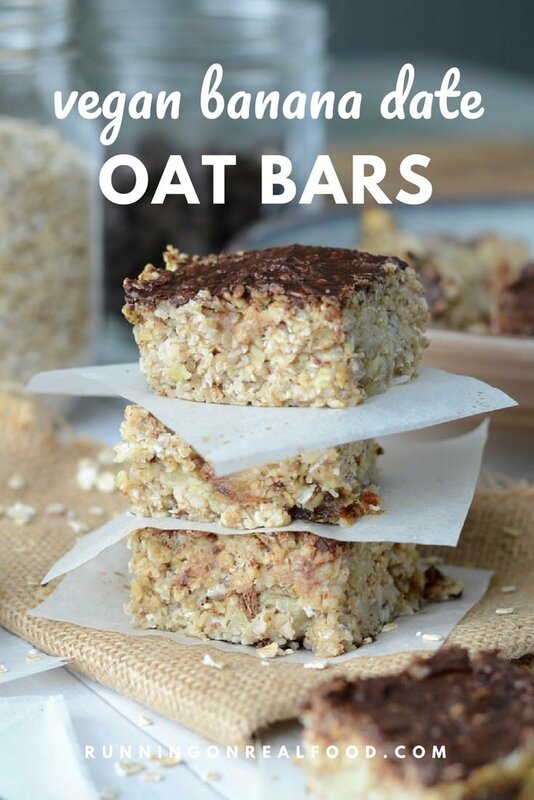 If you’re a fan of baked oat bars, I’ve posted a few others that require even fewer ingredients and taste just as good! Baked oat bars are vegan baking made super simple, pretty much fail-proof, low sugar, low fat with all the yumminess. For more baked oatmeal bars, check out my Strawberry Banana Protein Oat Bars, Baked Banana Chocolate Chip Oatmeal Bars and my Peanut Butter Banana Oatmeal Cookies. These vegan date and banana oatmeal bars are a great option for busy mornings. Store a batch in the fridge for quick breakfasts on-the-go. Gluten-free, vegan. Add the oats, flax, coconut and cinnamon to a bowl and stir to combine. Mix in the vanilla and almond milk. Remove the bars from the oven, melt the chocolate chips if using and spread over the bars. Let cool before slicing into 16 bars. It’s not necessary to use additional sweetener, especially if you plan on topping these with chocolate. If you’re not using a chocolate topping, taste the batter add a few liquid stevia drops or raw stevia if you’d like to sweeten it up a bit. 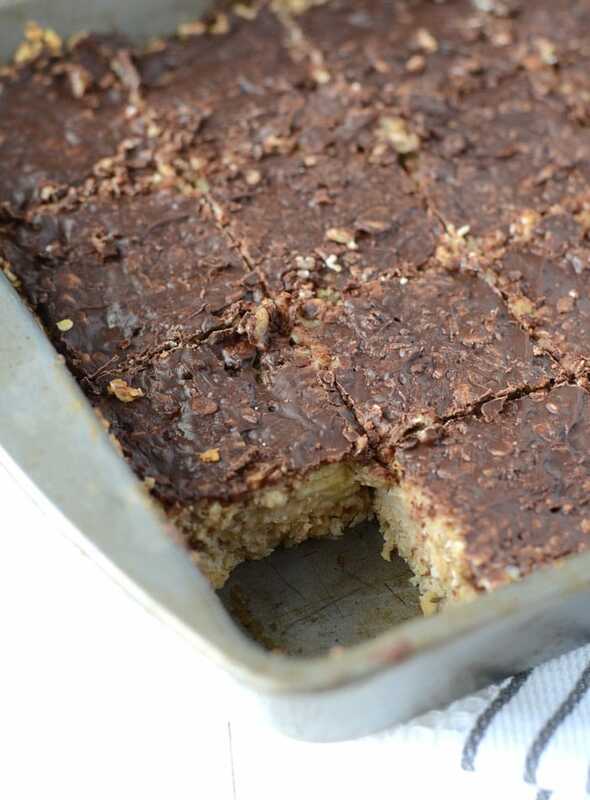 The bars aren’t super sweet but the bits of dates and banana do add a nice sweetness throughout. I add 2 packets of stevia when I make them even if I’m topping with chocolate. Up to you! These can be frozen and taken out as needed. Try them heated up, YUM!! Nutrition facts below include chocolate topping. Well, these look absolutely delicious – I would be VERY happy to wake up to these! I just found your blog today and am really enjoying it. Good looking food and I’m always glad to meet other runners! Just wondering the quantity of oats for this recipe? Looks like you may have forgotten to list. Thanks! Oh my gosh! I totally did!! Thank you for letting me know, I’ll have to find my notes or make them again because I can’t recall. I’ll try to let you know asap! I guess it slipped my mind to check on the amount of oats. I’m going to have to re-make these to figure it out because in my notes I forgot to write the oats down too! Stay tuned! Just came across you today ..love your posts ! i just came across this recipe and it looks great, but i noticed that you forgot the oat amount and saw in the comments that you were going to make them again. do you have the oat amount? I would like to try these! In the description you list as oil free. But step 3 lists coconut oil but its not included in the ingredient list. Would you mind clarifying? Thanks! I forgot I updated the recipe and removed the coconut oil, so it actually doesn’t call for any. I took it out of the instructions, thanks for catching that! Enjoy! Yum, I love dates! And bananas! This looks awesome. These sound amazing! I think my family would really love these. Also, love that they’re vegan and made with dates! I love that these sweet treats have no added sugar! Dates are my favorite! I’d eat these for breakfast, a snack OR dessert! loving that chocolate layer on top! these look delish. These are soooo calling my name. And I just so happen to have all the ingredients on hand. That’s always a big win! Everything’s better with a little chocolate on top right? 😉 These look great! I am always in for recipes that I can throw bananas in! These looks so good! Would it affect the recipe to use old fashioned oats and not quick? Thanks! No, that should be fine. Thanks!